Ant larva is like a worm and can reach adult size, but has no eyes, no legs and no antennae. 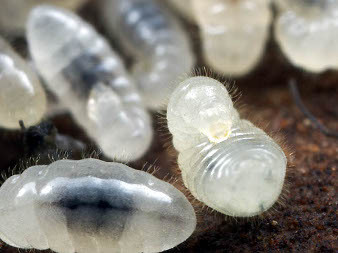 The larvae are perpetually hungry and feeding holds workers for several weeks. In addition, they must be kept at constant temperature for their development, so they are often moved among the nest. Enfin, les larves s’arrêtent brusquement de manger : elles sont prêtes à se transformer en nymphes.